Why are my Aglaonema's leaves turning yellow rapidly? I have an Aglaonema (also commonly known as a Chinese Evergreen) at my desk at work. Over the past month or so, its leaves have been yellowing and dying rapidly. This is how it looked today, a Monday; last Thursday, I removed the dead and dying leaves, so the yellowing you see in the photograph happened over four days. My desk has a southwest facing window high up on the wall; the plant is on a level with the window and is a few feet from it. There are tall trees near the building, but they're not in leaf yet, so it gets some indirect sunlight every day. 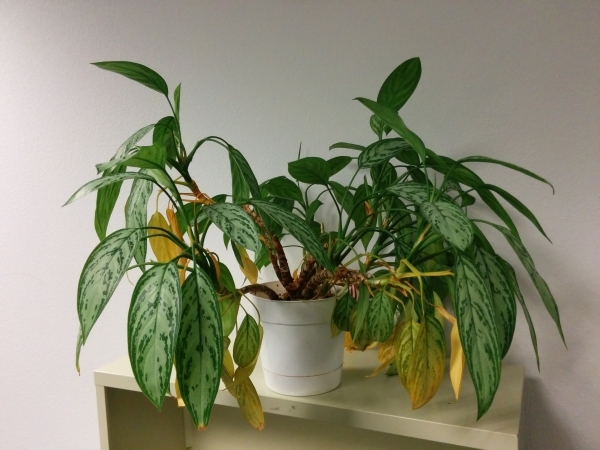 I've been sitting at this desk for 1½ years, and my plant wasn't like this last year. What is causing this, and how can I help my plant recover? This looks like overwatering to me. This is the most common cause of stress or death for houseplants. consider rejuvenation: cut one third of the stems off leaving six inches of bare stem and root in water. Once they are rooting cut another third of the stems off the parent plant and root in water. Aglos readily bud from old stems. With this method you can rejuvenate the old plant and have a backup in the form of cuttings you can pot up in six to eight weeks. Reduce watering for the parent plant after you have cut back the foliage to make cuttings. Edit: Michelle suggests repotting which can be helpful. It depends on the extent of the overwatering. If the plant is potbound and a little bit overwatered, then yes, repot. Severe overwatering is quite a stress on a plant and repotting would just add more stress. In this case taking cuttings as suggested is a better idea. Check the roots in the soil. New roots are firm and white. Old roots are brownish. Dead roots can be soft and mushy or papery if they have dried out. Not the answer you're looking for? Browse other questions tagged diagnosis houseplants leaves or ask your own question. Why are the leaves on my pink Aglaonema fading and turning yellow? Why are two of my plants drying out and turning yellow? Why is my Japanese painted fern struggling? Why are some clippings of this plant apparently pure green and others mottled with yellow? Why are my aloe leaves turning white and brown? Why are the leaves on my mango tree turning brown and drying out? Why are my anthurium leaves rapidly turning yellow? Why are my Dracaena Fragrans leaves browning from the base?